The open layout of Cyprus invites possibilities. Have friends over, and gather around the large kitchen island before relaxing in the covered lanai. Or enjoy a board game as a family in the naturally lit upstairs loft. Curl up with your e-reader in the flex space off the foyer that makes a cozy den, or withdraw to your tucked-away downstairs Owner’s Suite, with its huge walk-in closet. 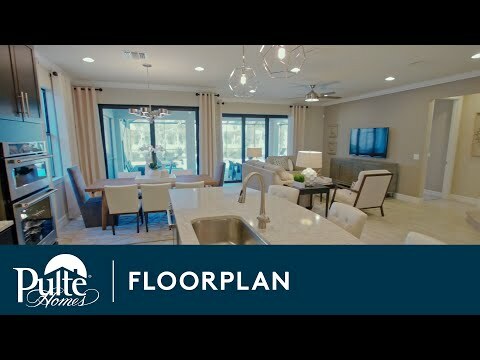 Step inside Cyprus to see the Life-Tested Home Designs® with more usable space where you want it most. So you live the way you want to live. Cyprus is known for its open concept. An expansive loft lives atop the stairs, while downstairs the gathering room offers raised ceiling height and coffering, adding dimension to the space. The downstairs owner’s suite has a walk-in shower and bountiful storage space. Enjoy outdoor living with the brick paver patio under the covered lanai. The two-story Cyprus is perfect for growing families. Promoting togetherness with its connected gathering room, kitchen, and outdoor area. Enjoy family time in the upstairs loft or escape to the owner’s suite, featuring a spacious walk-in closet.